DECLARATION OF INDEPENDENCE. 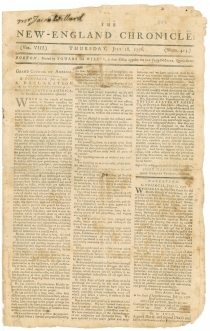 The New-England Chronicle, July 18, 1776, Vol. VIII No. 413. 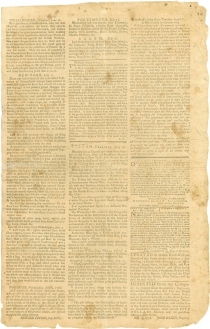 Newspaper, with the entire text of the Declaration on page 1 of 4. Subscriber’s name “Mr Jacob Willard” written at top of page 1. Boston: Printed by Powars & Willis. A rare and displayable July 1776 printing of the Declaration of Independence that gave many Bostonians their first view of America’s immortal founding document – even before it became ‘unanimous’. Only ten copies of New-England Chronicle issue are known, eight of which are held by institutions. This is one of just two on the market in the past 40 years. Printed copies of the Declaration were sent from Philadelphia by John Hancock and others, starting on July 5th. The Declaration was circulated as thoroughly and as quickly as possible that Revolutionary summer. Timeliness of publication depended on how long the initial copies spent in transit, as well as the newspapers’ printing schedules, in most cases once a week. The first Massachusetts printing was a broadside issued in Salem ca. July 13th-15th, and then in the July 16, 1776 issue of Ezekiel Russell’s American Gazette. On July 17th, the Massachusetts council ordered an official broadside printing to be sent to all parish ministers for public reading, and then to be recorded by town clerks in the town’s books. 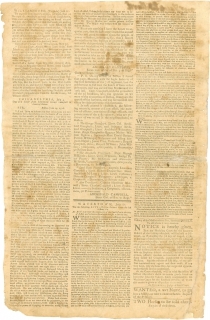 By the end of August 1776, the Declaration had been printed in at least 29 newspapers and 14 broadsides; all are extremely rare on the market. 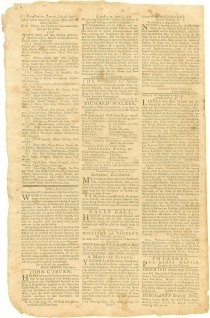 The last copy on the market of the first official broadside (one page) of the Declaration, by John Dunlap, sold at Sotheby’s in June 2000 for $8,140,000, but has subsequently been re-sold privately for significantly more. 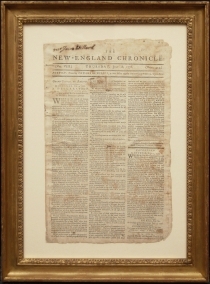 The last copy on the market of the first newspaper printing, the July 6, 1776 Pennsylvania Evening Post, sold at Christie’s in 2007 for $360,000. The last Salem official broadside on the market, in 2004, sold for $456,000. And the last copy on the market of the Boston broadside, printed by Gill and Powers, sold at Christie’s on June 24, 2009, for $693,500. The New-England Chronicle easily beat out the official state printing. That broadside, prepared in Salem by Ezekiel Russell, was not distributed until later July or early August. Abigail Adams heard it read in her Boston church on August 11 – three weeks after Powars and Willis published their scoop. · The arrival of Connecticut reinforcements in New York City (“as fine a body of men as any engaged in the present grand struggle for Liberty and Independence”). · A report from Trenton that up to 10,000 British troops had landed on Staten Island. · A famous act of patriotic vandalism in today’s Wall Street area (“Last Monday evening the statue of King George the Third, on horseback, in the Bowling-green was taken down, broken to pieces, and its honor levelled with the dust”). It was then melted down and cast into musket balls. · On the last page, notices from Samuel Langdon, president of Harvard College, announce the cancellation of public commencement ceremonies “in Consideration of the difficult and unsettled State of our public Affairs” and set a date for examinations of prospective students. In the wake of the Battles of Lexington and Concord, followed by King George’s proclamation that the colonies were “engaged in open and avowed rebellion,” the Continental Congress decided enough was enough. The committee appointed to draft a statement declaring independence turned the task over to their most eloquent writer, Thomas Jefferson. In Philadelphia on July 4, 1776, after some revision, Congress formally adopted his declaration. Church bells rang in Philadelphia, and word was spread throughout the colonies. Thus a new nation was born. Multiple thirteen-gun salutes honored the Union of thirteen colonies. Boston had only recently driven occupying British troops from the city after a prolonged confrontation lasting from July 1775 to March 1776. The siege of Boston ended when American troops fortified Dorchester Heights overnight with artillery trained on British ships in the harbor. The fleet sailed away in defeat and General Howe turned his efforts to capturing New York. Washington anticipated this strategy and strengthened his forces in New York in preparation for its defense. This newspaper also addresses fears of biological warfare. The British had long been suspected of using smallpox as a weapon. During the French and Indian War (1754-1767), the commander of British forces in North America had proposed infecting hostile Indian tribes. (Because smallpox was rampant in Britain, most of the troops had gained immunity.) One article in this issue claims that the British had now attempted to infect Continental troops, by leaving blankets behind when they evacuated Fort Johnston in North Carolina. For the Americans, inoculation was an option with considerable drawbacks. The procedure used a live virus, causing a mild form of the disease that could spread contagion. Washington, himself a smallpox survivor, was reluctant to endorse inoculation because his troops would be incapacitated during recovery; Benedict Arnold issued an order in February 1776 forbidding it. Since the army was already infected, new recruits quickly fell victim to the disease. During the 1775 siege of Quebec, up to a third of the American troops were ill with smallpox, signaling that the disease itself could affect the course of the war. By the winter of 1777 at Valley Forge, General Washington had reversed his policy. That decision was pivotal in winning the war in the South, providing an army of fighting men who were immune to the scourge of smallpox. MA: American Antiquarian Society, 1947. Diamond, Jared. Guns, Germs, and Steel. New York: W. W. Norton, 2005. Hazelton, John H. Declaration of Independence, Its History. NY: Dodd, Mead, 1906. James Adams, 21-22 July 1776, found at www.masshist.org/DIGITALADAMS/AEA/cfm/doc.cfm?id=L17760721aa. Vaccination.” Baylor University Medical Center Proceedings (Jan. 2005) 18(1):21-25. Independence.” Harvard Library Bulletin 3 (1949). The Declaration became unanimous on July 9, 1776 when New York finally voted in favor. The title of the Declaration was changed to “The Unanimous Declaration . . .” in August 1776, when the signed vellum copy was engrossed. Campbell adds a request to General Howe to negotiate a release for his men and himself, if possible. That release was consequential, as it turned out: Campbell went on to lead the 3,500 British troops that captured the city of Savannah, Georgia in December 1778. Abigail Adams to John Adams, July 21-22, 1776.